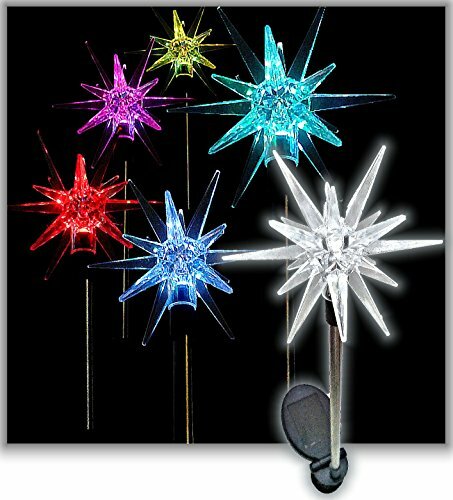 Brilliant starburst: Smart color changing bright LED light creates vibrant starburst. 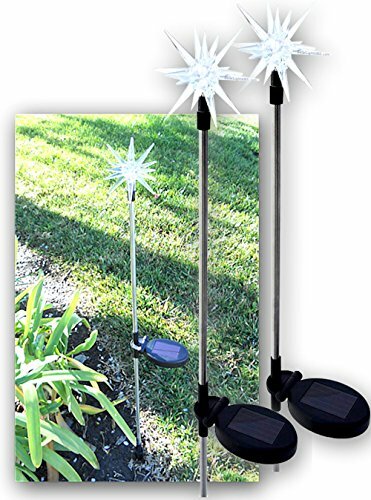 No hassle of finding electrical supply: Plug the star metal stake at any bright spot on the ground and let 1.8″ X 1.5″ Square Crystalline Solar Panel charged up a built-in 600 mAh-AA-Ni-Cad rechargeable battery. Totally no need for power cord connection! 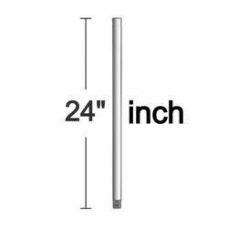 Perfect height: 32 inch long metal stake poles for each Acrylic 3.75″ W x .75″ L x 3.75″ H Starburst. These garden stakes are absolutely lovely. 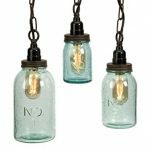 I only purchase solar lights now and was so happy to add this unique design to my collection. I placed them in the sunlight as soon as they arrived to get them charged. By that evening they were good to go and glowing beautifully. My son loves these stakes and says they’re shooting stars. He is already asking me to buy more! The quality of the stakes is also very high. We had some very high winds shortly after I placed them in our yard and one of the stakes were knocked over onto our pavers. I was sure that it broke. I didn’t see any visible damage and was holding my breath until that night to see if they came on again. Sure enough the stake shined as bright as it always had. Will most certainly be purchasing more! 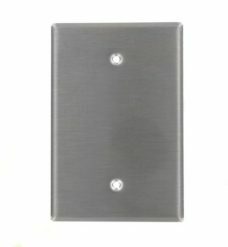 – Star Lights turns on automatically when its sensor detects insufficient light in its surrounding. 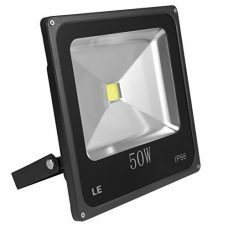 – White LED is able to changed its color to red, green and blue lights automatically. 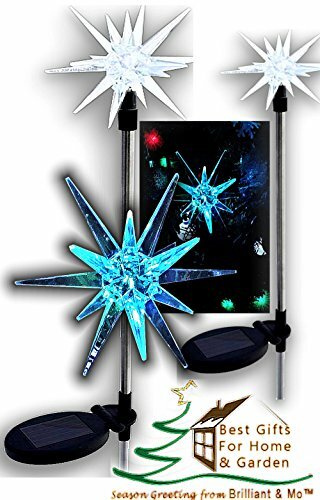 Perfect addition to patio and garden for all seasons: Our solar star lights is the perfect decoration/gift for all patio and garden throughout all seasons as star is a timeless symbol of hope and wisdom. Get it now and let this sparkling star lights bring hope and joy to your family and friends.